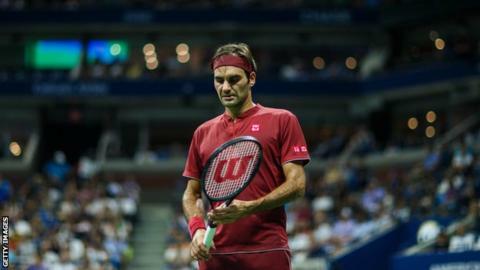 Roger Federer said he was "happy the match was over" after playing in "uncomfortable" conditions during his shock fourth round US Open defeat. The 37-year-old Swiss - a five-time champion at Flushing Meadows - was beaten 3-6 7-5 7-6 (9-7) 7-6 (7-3) by world number 55 John Millman. "I felt I couldn't get air. There was no circulation at all," Federer said. "At some point also I was just happy that the match was over, I guess." Tournament organisers kept the roof - which was completed in 2016 - on the Arthur Ashe Stadium open on Monday, but world number two Federer believes its installation has reduced air circulation on the court. "I think just that makes it a totally different US Open," said the 20-time Grand Slam champion. "Plus conditions maybe were playing slower this year on top of it. You have soaking wet pants, soaking wet everything. The balls are in there, too. You try to play. Everything gets slower as you try to hit winners." Federer's defeat to Australian Millman marked the first time he has lost to a player ranked outside of the top 50 at the US Open. Brisbane-born Millman said he "felt like a deer in the headlights to begin with" and had also struggled in the heat, calling the tournament conditions "pretty brutal". "I'm not usually much of a sweater. I mean, I was dripping," said the 29-year-old. "The conditions for the majority of this tournament have been pretty brutal. "I found it pretty tough early on to hold onto the racquet. It's kind of moving around in your hands." Millman - the only unseeded player left in the last eight of the men's draw - will play two-time champion Novak Djokovic in his first Grand Slam quarter-final on Wednesday. He admitted to feeling "a bit guilty" after beating Federer, who he described as his "hero". "I always was of the opinion that I was in the fourth round for a reason. I've never played anyone's reputation," said Millman. "I felt a little bit guilty today because he didn't have his best day, and that's for sure. "I have so much respect for him, what he's done for the game." Millman lost in straight sets to Djokovic at Queen's in June, but said he has "the belief" he can defeat the Serb in New York on Wednesday. "I'll have to improve a lot on the last time I played him. He's an incredible player. I think he's in some really good form right now, too," he said.